What began as a slow decline is now picking up speed as the market zooms lower once again. The oil market is turning lower again this morning after printing meager gains yesterday. Crude oil is currently trading at $55.91, down $1.29 (-2.3%) from yesterday’s close. Fuel prices are also in the red this morning. Diesel prices are at $2.0516, dropping 3.5 cents (-1.7%) this morning but still trading above the $2/gal level. 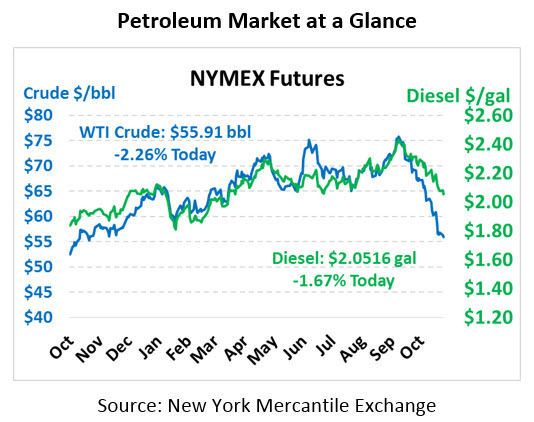 Gasoline prices are $1.5366, down 4.6 cents (-2.9%) from yesterday’s close. 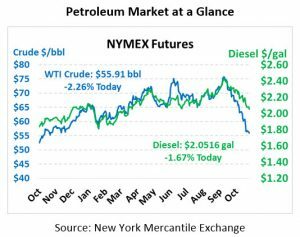 It’s interesting to note that just one month ago, we questioned whether gasoline would fall below $2/gal – now the question is whether it will sink past $1.50. There’s not much news to drive the markets this morning, leading traders to focus on the approaching December 6 OPEC meeting. Libyan officials are requesting an exemption from any production quotas given national instability, but their current production rates are nearly double what they were when they were exempted from quotas in 2017. Saudi Arabia has been pushing for a 1.4 million barrel per day production cut in 2019, though Russia does not seem inclined to join this go-round. At a conference, the Fatih Birol, executive director of the IEA, indicated his opposition to any future production cuts. His concerns focus on the global economy, which he considers “very fragile” – higher prices could further exacerbate the global economic situation. Birol called for “common sense” from producers to ensure the market does not tighten further, even while admitting that markets are currently amply supplied.